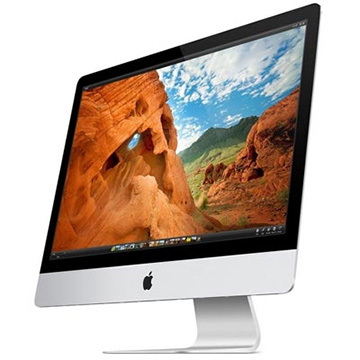 This BTO "Build to Order" iMac Core i7 3.5GHz 27-Inch 5k Retina Screen (Late 2014) is powered by a 22 nm Haswell Quad Core 4.0GHz Intel 'Core i7' 4790K processor with a 8MB shared level 3 cache. This model sports dedicated Graphics thanks to a Radeon R9 M290X graphics processor including 2GB of GDDR5 graphics memory. Base configuration comes with 4 memory slots with 8GB DDR3-1600 (PC3-12800) SDRAM installed as a pair of 4GB SODIMMs (with 2 slots empty) and a 1TB Fusion Drive, a "FaceTime HD" webcam and stereo speakers with no optical drive. This model has a 27" 5120x2880 5k Retina LED 16:9 widescreen IPS display with a monolithic glass laminated LCD panel. The sleek aluminum housing of these models tapers to a slim 5mm edge around the screen perimeter with greater girth in the center of the unit. Ports and connectivity come via 4 USB 3.0 ports, 2 Thunderbolt ports, 1 Gigabit Ethernet, 802.11a/b/g/n/ac compatible and Bluetooth 4.0.